Apple has released four new “Shot on iPhone” commercials, some demonstrating the slow motion video recording effect of the iPhone camera with a focus on wildlife, while another demonstrates the time-lapse camera capability. Two wildlife themed commercials show a chipmunk eating a peanut nearly the size of its head, and the other advertisement features an ant carrying what looks like a leaf in its mandibles. Another is a black and white video of a girls hair blowing around in the wind, and the other ad shows the descent from a tram ride into a town. Each has been embedded below for easy viewing. Chipmunk Eating a Peanut – Shot on iPhone by Linda H.
Ant Carrying a Leaf on Sand – Shot on iPhone by Tim W.
Tram Ride Into Town – Shot on iPhone by Robert S.
Girls Hair Blowing Around – Shot on iPhone by Marc Z. The Shot on iPhone campaign does a great job of demonstrating how regular iPhone users can capture some pretty amazing footage and pictures with the devices camera, and the advertisement series appears to be fairly popular. Apple recently introduced some other recent “Shot on iPhone” commercials which you can see here, and if you enjoy watching Apple ads there are plenty of others here. Cute, but they are still pests at bird feeders like their cousins the gray squirrel and red squirrel. Sorry, dude….but human beings are the real pests. Bud of Old… LOVED your reply. While squirrels go into bird feeders looking for food because they are hungry, “humans” hunt animals for sport. Animals are so perfect! I like the tram video. The girl’s hair looks like Medusa, LOL. So …. iPhones have a camera? If only they put this much effort into updating their iMac/Macbook Pro/Mac Pro/Mac Mini product lines. How do you not update your professional Mac Pro machine for THREE YEARS??? Typed and submitted by a Macbook Pro. Apple is the iPhone company. Apple cares about selling iPhones for as much as possible to juice shareholders and stock price. That’s what Apple cares about. So, iPhone commercials! Not selling as many Macs lately. PC sales are up, Mac sales are down. It’s NOT terribly hard to do basic HW updates. Whether we like it or not we are in the early stages away from the time when most people will have desktop computers — even laptops. As connected devices become the norm the need for a centralized computer decreases. 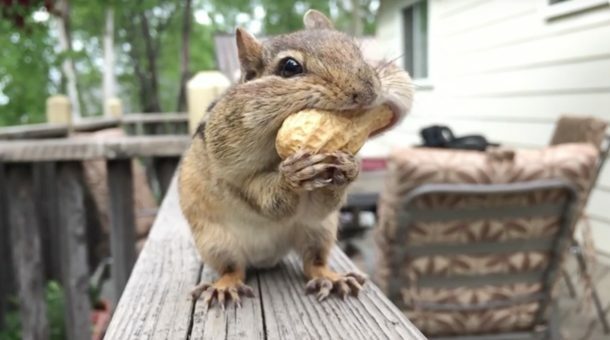 That is most definitely NOT a squirrel, it’s a chipmunk. You can tell by the stripes on it. Did you even read the article? It tells you exactly what song is playing.